Enjoy to the Fullest, Everywhere. Disclosure: There's a good chance this post contains affiliate links. Purchasing through my blog helps me stay on the road! So, thank you! So, you need an adventurous Patagonia itinerary. 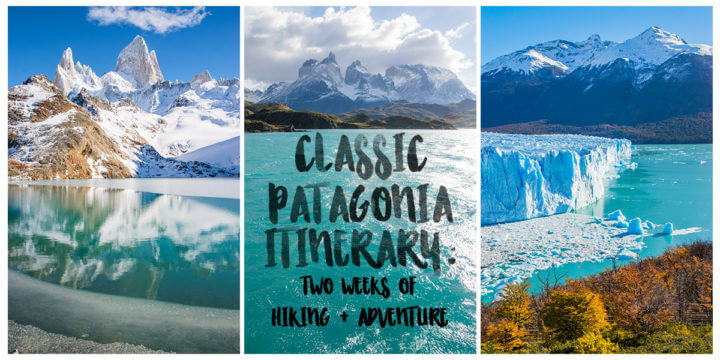 I’ll tell you now, you’ve made a fantastic choice to plan a Patagonia trip! 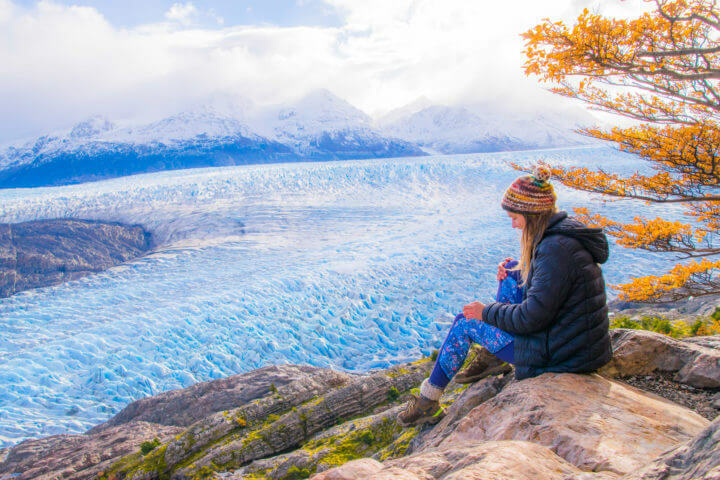 Visiting Patagonia may just be one of the best decisions of my life, and I don’t think I will ever get over the incredible views and scenery I saw here while doing some of the most scenic hiking and trekking in Patagonia – the best in the world. 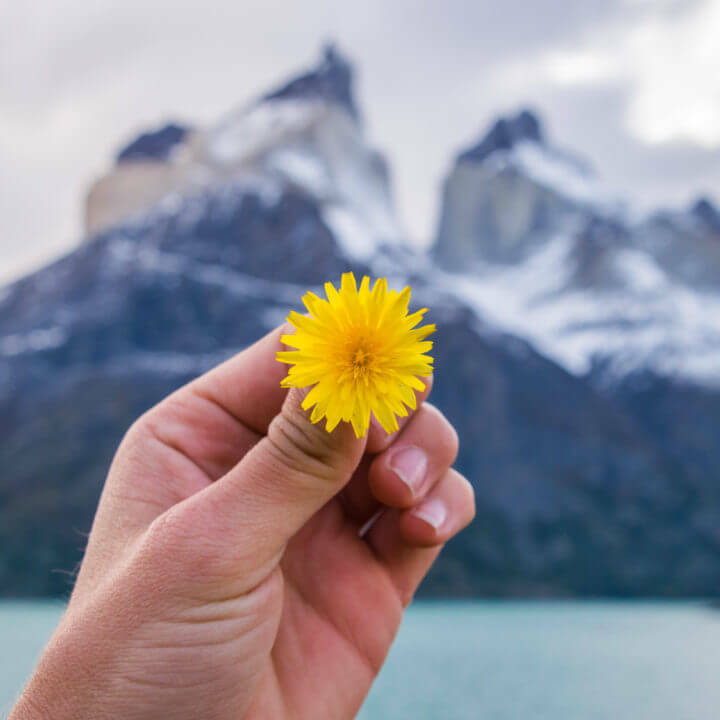 This 2 week Patagonia itinerary will take you through some of the best places in both Chilean Patagonia and Argentinian Patagonia, in the southern part of both regions. 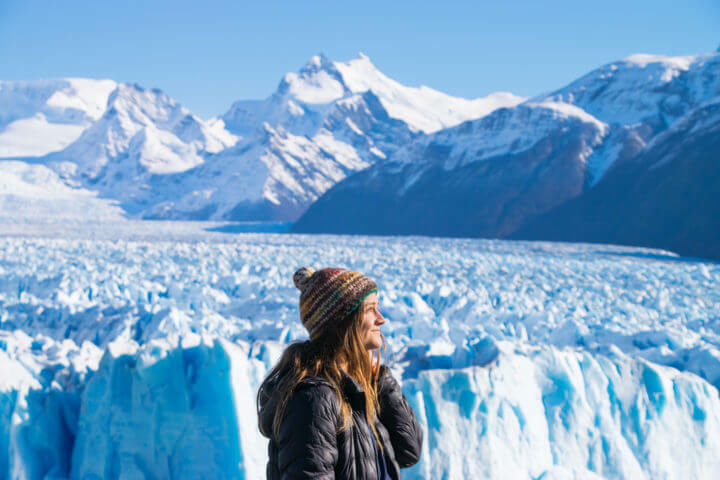 More specifically, you’ll see Punta Arenas, Puerto Natales, Torres del Paine National Park, El Calafate, El Chalten, and a few sights in Los Glaciares National Park. These places are where the most dramatic and impressive mountains stand sentinel over tiny wooded towns, and thin blankets of snow cover arid landscapes along remote mountain roads. 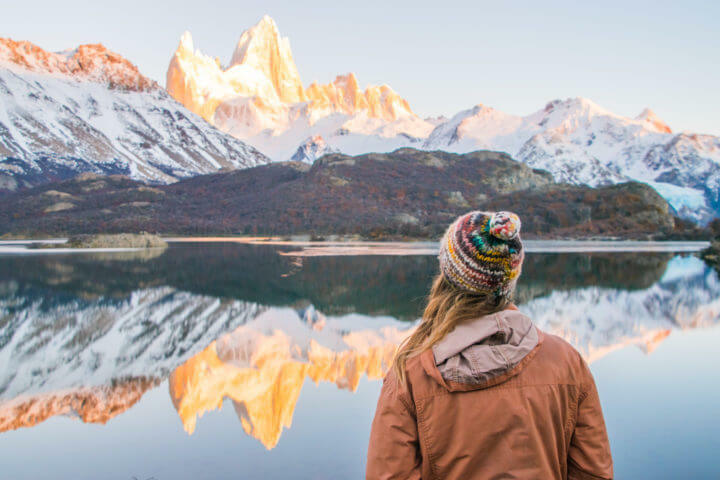 This adventurous Patagonia itinerary involves the W Trek in Torres del Paine, the Fitz Roy trek and possibly Laguna Torre treks in El Chalten, and the Perito Moreno glacier in El Calafate. It’s a classic itinerary for first-timers to Patagonia and can be combined with my northern Patagonia itinerary to make a month if desired. 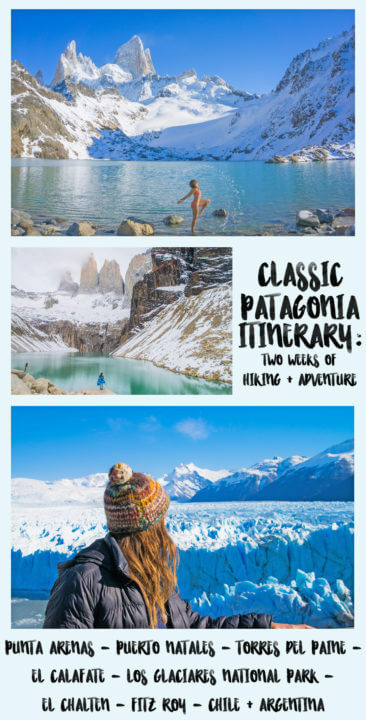 I’ve added in other adventure options as well if you want to go all out – this 2 week Patagonia itinerary is more of a freestyle guideline where you can ‘choose your own adventure’ if you will, and also choose different accommodation in Patagonia according to your needs. You will want to plan many of these tours out beforehand, so follow the links I have included if you want my best tips on companies to book with – especially for the W Trek, because the refugios book up very quickly. This route does not include Ushuaia in Argentina, so make sure to add some time if you’s like to go there too. When is the Best time to Go to Patagonia? 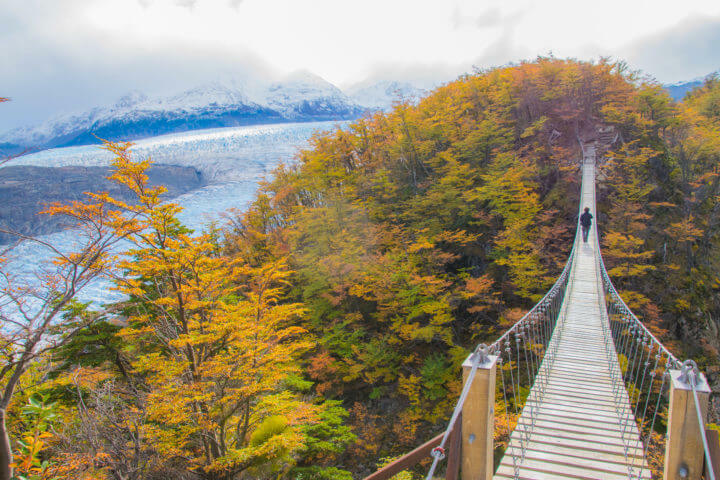 You may be wondering what time of year is the best to do this southern Patagonia Itinerary. Honestly, pretty much any time of year is great for 2 weeks in Patagonia because each season has its benefits. 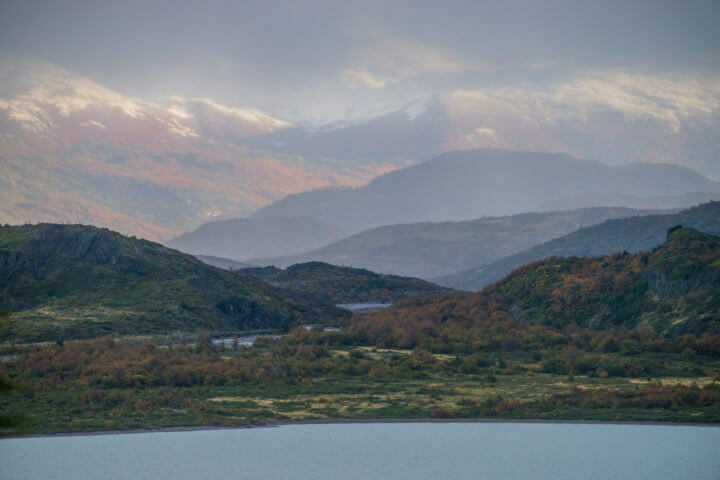 Weather is unpredictable all year, especially in Torres del Paine, so there’s no way to get around possible inclement weather. However, here’s my rundown of each season in Patagonia. Summer in Patagonia is the most ideal because temperatures will be far warmer. Summer is the best for camping but is also very crowded. 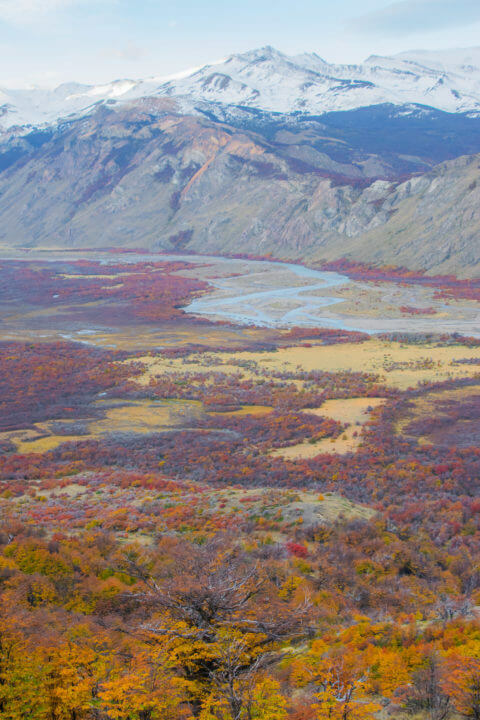 Autumn in Patagonia is when I went, and I honestly believe this to be the best season to go. I’m not kidding when I say I have NEVER seen fall colors like I did in Patagonia – I don’t think I’ll ever get over some of those views. It was definitely colder and I wouldn’t camp at this time of year, but if you don’t mind a bit of cold, the color is worth it a million times over. Read my blog post about Patagonia in autumn! Winter in Patagonia is probably not the best idea. Refugios close around early to mid-May, and there are only a few companies (including ChileTour Patagonia) that will organize camping in the winter. But it will be freezing! Spring in Patagonia would also be an ideal and slightly less crowded time to visit Patagonia. Flowers bloom (on all the trees that turn bright colors in the autumn) between spring and summer, which is another amazing sight to see along any trek. It will still be chilly! 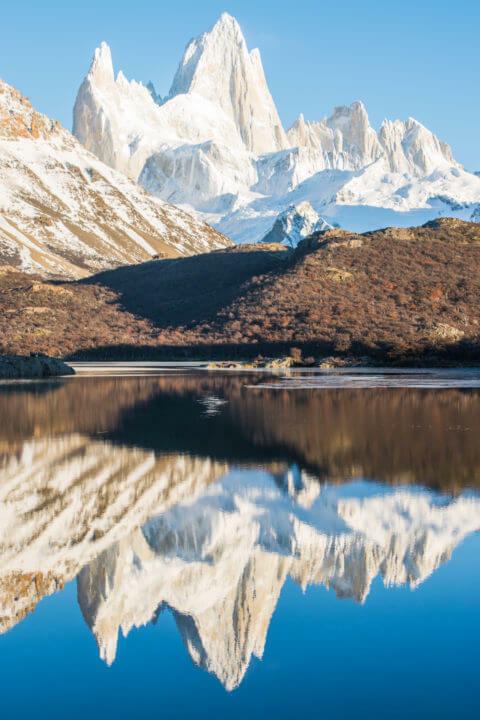 I have included the 5 day/4 night Torres del Paine W trek in this Patagonia Itinerary because it’s one of the most famous treks in the world and presents some of the best views Patagonia can offer. It’s truly an adventurer’s dream! 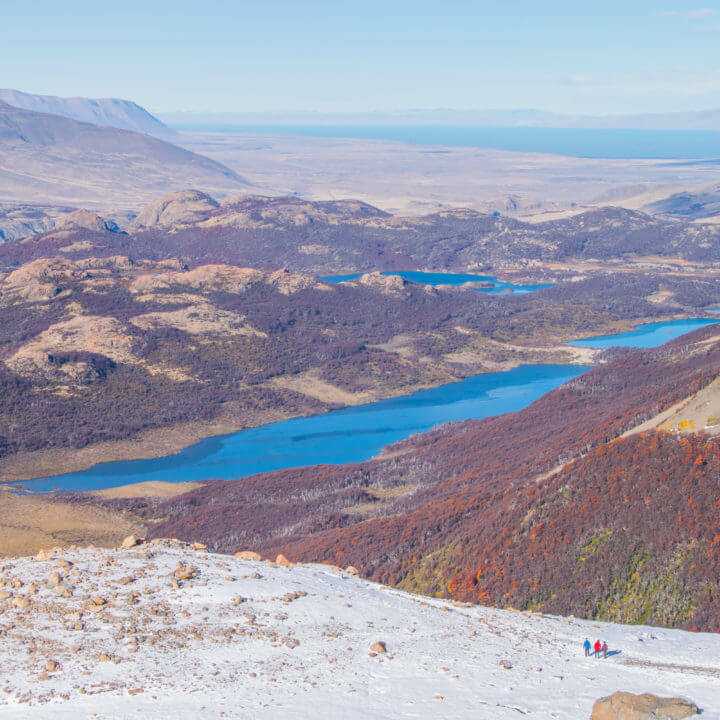 You should have your W Trek planned out before you arrive into Puerto Natales – far before! The refugios and campsites book up fairly quickly, especially in summer. For this reason, you’ll want to either book a tour that reserves everything for you, or reserve your spots as soon as you can. I have included links to book the refugios and campsites, so you can check if your dates are currently available. Make sure to also know what to pack for hiking in Patagonia. Campsites book up less quickly than refugios, however, and are often far more possible to do at the last minute. 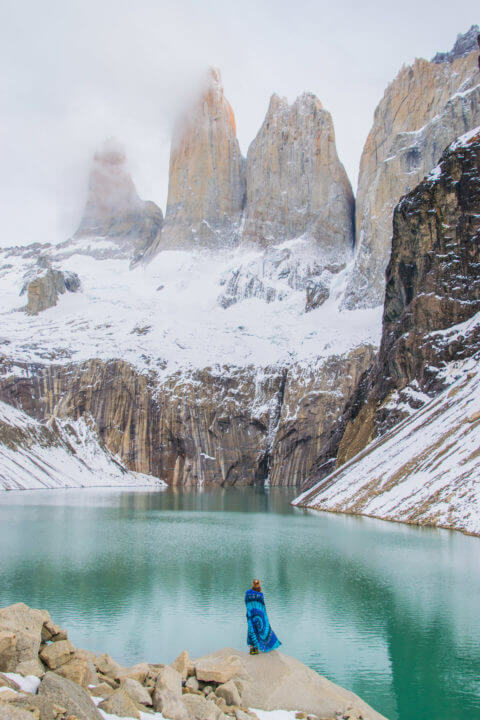 You can do some research and plan it out yourself, or check out my Torres del Paine W Trek post that I did with ChileTour Patagonia, a company that I loved and was fairly affordable compared to other companies. Once you arrive in Punta Arenas, settle in and rest! Depending on your flight arrival time you may have more or less time in the city, but use it to get accustomed to Patagonian weather and beat any jet lag you may have. There are very cheap flights to Punta Arenas from Santiago, the capital of Chile. Santiago is the easiest place to fly into, and from there you can get another cheap flight down to Punta Arenas. I booked my flight less than a month before, and it came out to around $72 with a bag! This is the cheapest airport to fly into in Southern Patagonia. Patagonian Pelicans in Punta Arenas – View the rest of my Punta Arenas photos right here! Hotel Rey Don Felipe was a beautiful hotel right in the center of town, with an amazing hot buffet breakfast that was absolutely to-die-for! There was a lovely view from the window, and I woke up each morning to the sun shining over the beautiful and colorful city. They have an all-day snack menu or a fancy dinner menu at their fully equipped restaurant. We even tried a classic Patagonian ‘Calafate Sour’ as a welcome drink! The staff were always so helpful and their common space was a perfect place for me to catch up on work. There are a few hostels in Punta Arenas for backpackers – check them out on Hostelworld. 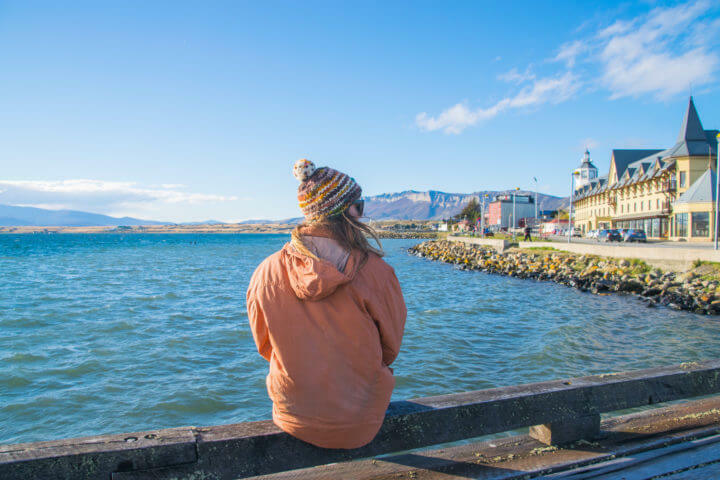 Patagonia Itinerary Day 1: Rest, relax, explore Punta Arenas, and prepare yourself! 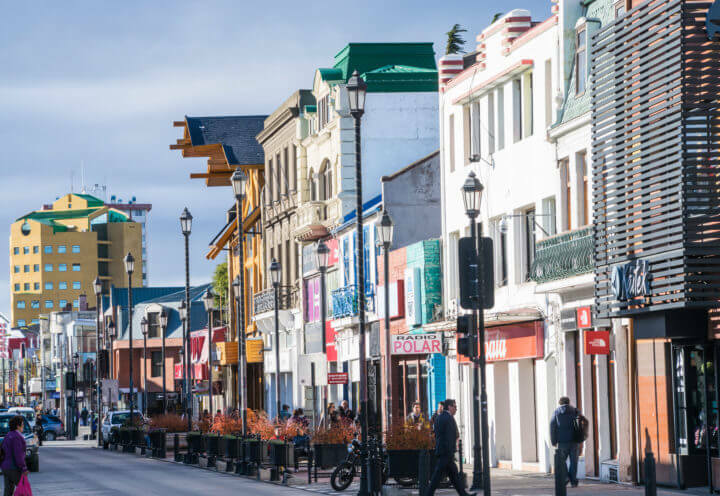 Today, depending on what time you fly in, you might have an entire day or just an evening in Punta Arenas. You can walk around town, shop for any trekking/mountain supplies/clothes you may need, find $1 street empanadas, walk down to the shore to see the ‘Patagonian Penguins,” check out some of the cute cafe’s, shop at the markets along the streets (where I got my hat I wore all throughout Patagonia! ), find a nice restaurant for dinner, and get adjusted to the jet lag, because it’ll be go-go-go from here! Patagonia Itinerary Day 2: Day tour to Tierra del Fuego to see the penguins! 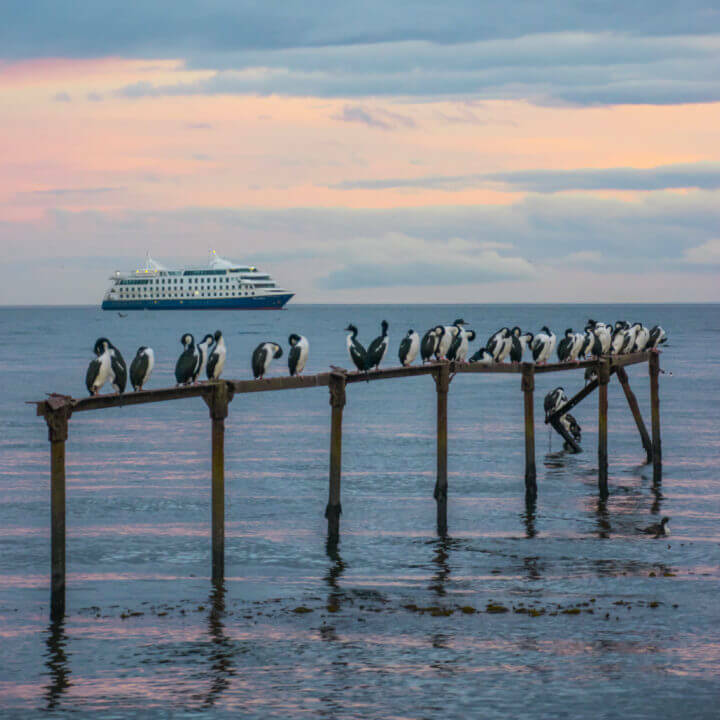 Depending on the time of year, you can book a day tour from Punta Arenas going south to the Isla Tierra del Fuego to see some Antarctic penguins! There are usually tours each day, but check to make sure there are tours and that it’s the right time of year for penguins. These will take you on a ferry to Porvinir from Punta Arenas, to the penguins for a few hours, and the up to some historical sites in San Gregorio and a few other points of interest. It’s not quite a visit to the arctic circle without seeing some real live penguins now, is it?! Another option is to take a tour to Magdalena Island from Punta Arenas. This is a bit closer and is another great place to see penguins. View the rest of my photo album from Puerto Natales: click here! 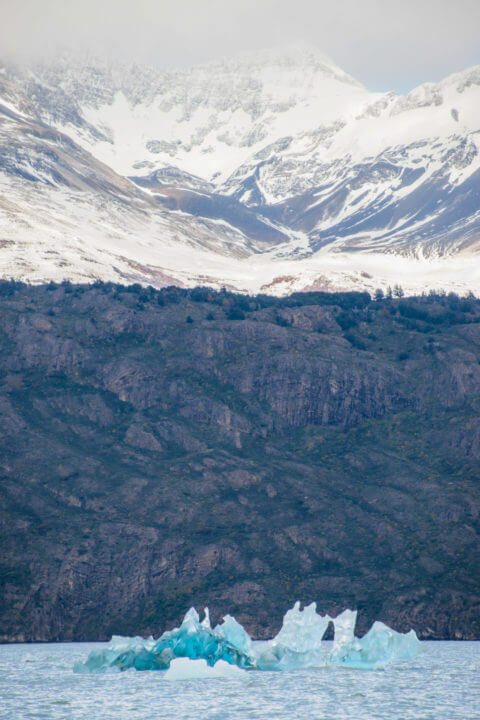 Now it’s time to start making your way north to the closest town to Torres del Paine! Grab a bus at any time from Punta Arenas to Puerto Natales! The bus station is right in town in Punta Arenas, and is walking distance from any accommodation in the center. It should take about 3 hours, and there are multiple busses each day. Once you arrive in Puerto Natales, you’ll be at the bus station about 2km from the center of town. You can get a taxi for about 1500 pesos to pretty much anywhere in the center, or just walk it! Puerto Natales and Torres del Paine cater very well to the luxury traveler, so there are quite a few amazing places to stay (including one of the top hotels on the continent!). There are also a lot of backpacker hostels. I stayed in the guesthouse of ChileTour Patagonia (the W Trek company I used) because our whole tour was run from there (and meals included) but here are some ideas for both the budget and comfort traveler. Hotel Costaustralis: This hotel is constructed in an old style and is right in the center of town. All rooms will look out to the lake and be within walking distance of everything. Remota Hotel: This lovely space is both architecturally creative and has all the amenities you could need for a luxurious stay – including a warm pool with a mountain view! Tierra Patagonia: This is a bit farther outside the city, but is uber-luxurious and closer to Torres del Paine. Vinhaus: This is one of the closest hostels to the city center and has a lovely space. First of all, make sure you’re ready for your big trek! As you will have seen in my Torres del Paine W Trek post, the weather is very unpredictable and you should be prepared for the worst, just in case. If you must, you can rent lots of supplies from your hiking company or shops around town. This includes all kinds of camping gear if you choose to camp, hiking poles (recommended), hiking shoes, hiking pants, gloves, and jackets. Apart from making sure you’re ready to trek, you should walk around town a bit. 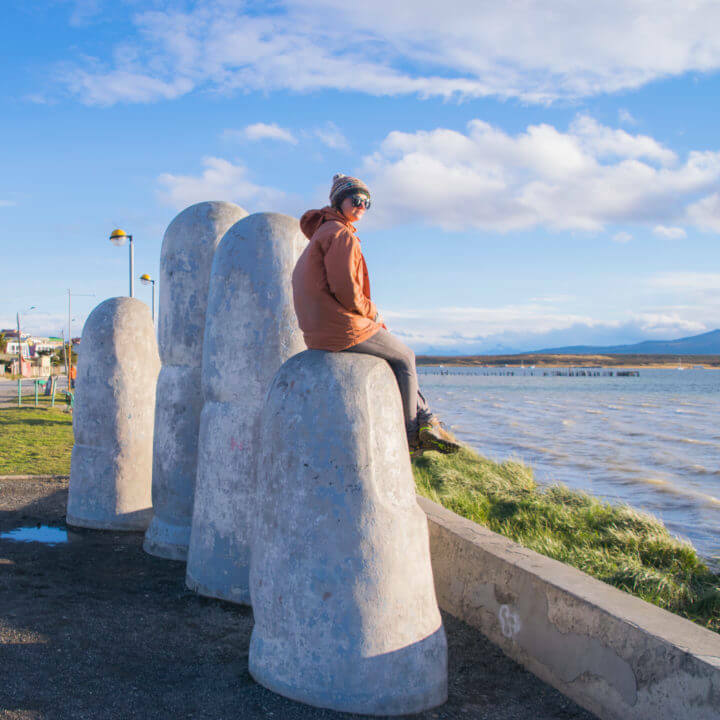 Puerto Natales is a beautiful and cozy little town with lots of beautiful sculptures along the water. Explore some of the shops, cafes, and bars, and walk along the water. The sunset could be great over the lake if you get a clear day! Chile also has cheap good wine and also artisanal beer – but maybe you should wait until after the trek to try it! 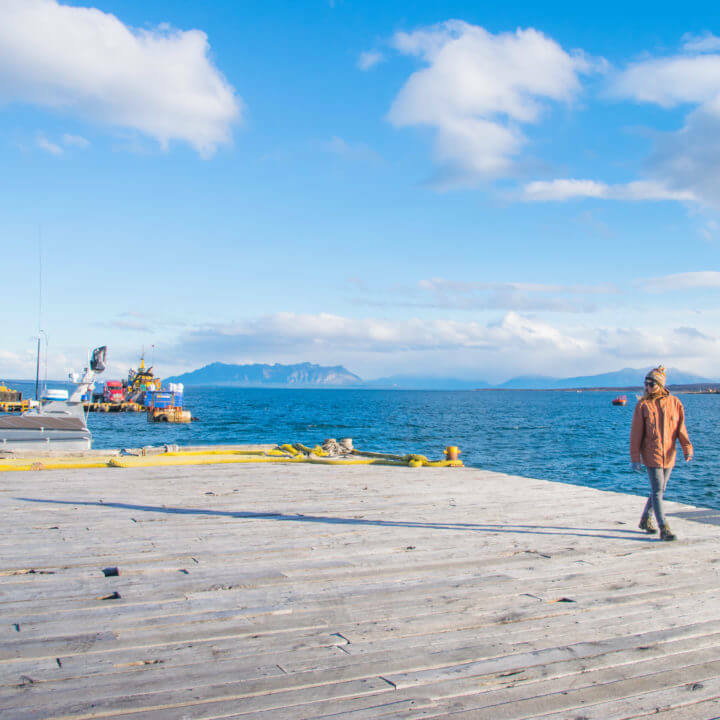 Other unique activities you can do while in Puerto Natales are going crab fishing (with a gourmet lunch) in some great fishing points nearby, and also doing a sightseeing bike tour of Puerto Natales. For those who do not want to do the whole 5 days in the national park, there are also full day tours to Torres del Paine from Puerto Natales. Gear/Supplies: Backpacking backpack with a waterproof cover (35-45L ideal), hiking poles, camera/GoPro, extra plastic bags, and make sure to travel with a headlamp whether camping or not! View the rest of my W Trek Photo Album (and order prints!) click here! All tour companies plan the W trek differently, and there are trekkers going both from right to left and from left to right. To keep it easy I’m going to list the way I did the trek for this Patagonia itinerary, but keep in mind you can do it both ways. 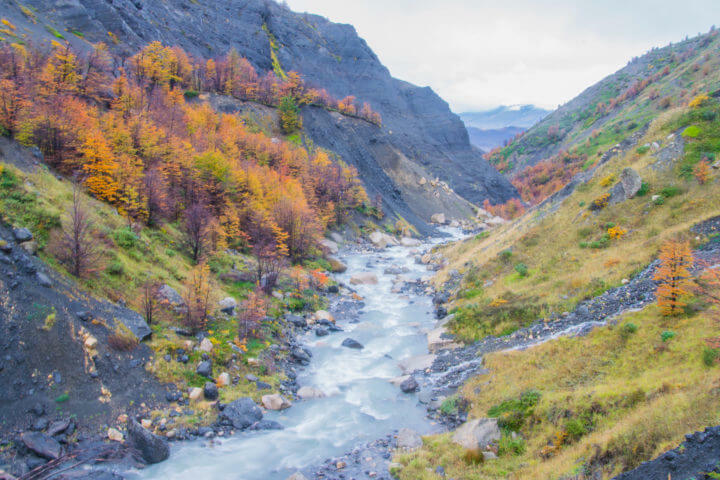 You can look at a trail map (they give you one upon entry) for specific trekking instructions; I have simply listed out the order and points of interest to make a more complete Patagonia itinerary. You can also see my post for my experience each day. As far as food goes, full board is available from all refugios, which I recommend. It’s pricey, but is much easier in my eyes than carting around cooking/food supplies to cook in the camping areas. If you have full board, there will be hot Chilean breakfast each morning, a packed lunch, and a hot three-course dinner served each evening. It’s lush, and it’s awesome. 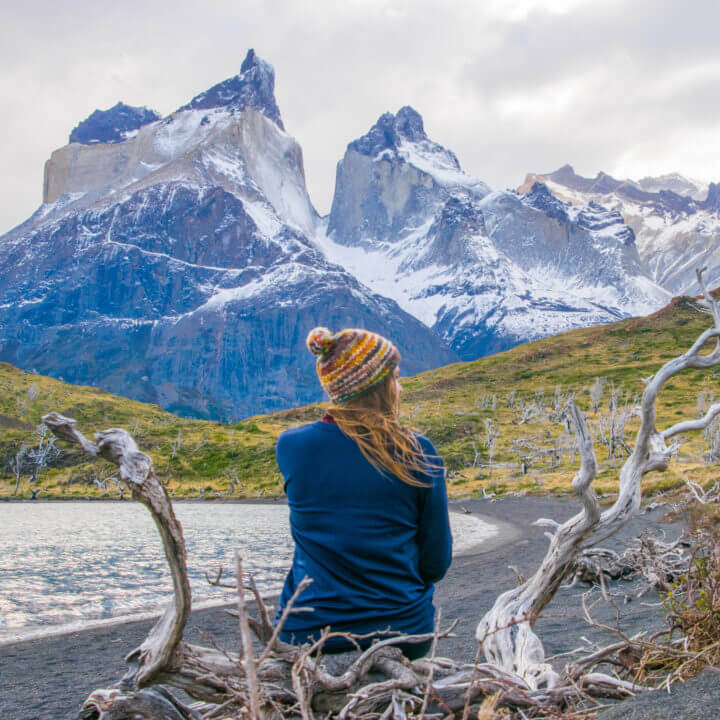 Torres del Paine is a place to splurge for many people. However, the camping areas pretty much all have functional kitchens as well. It’s up to you! There are lots of busses to the National Park from Puerto Natales. If you have an organized tour, your transport may be accounted for. If not, you can purchase a ticket to the park on any of many regular busses. For day 1 of the W trek, you’ll want to get the earliest bus you can to the National Park entrance (where you will pay about $35USD entry) and then to the first refugio, Refugio Las Torres. After arriving at Refugio Las Torres, it’s time to begin one of the most exciting days of the trek! Put your things away (aka set up your tent or find your room/dorm bed) and get going – you have a long way to go! It’s a big plus, however, that you can leave your heavy things at the bottom today. Today you will hike about 22km round trip to the most famous view of the trek, the base of the towers (Mirador de las Torres). This day has the most vertical gain, which you get over with while your legs are fresh. You’re welcome. Refugios on the way: You can stop at Refugio Chileno, which is 5km in, to grab a snack or drink if you need. Hotel Las Torres: This is the ONLY luxury hotel in Torres del Paine National Park – so if you have the funds, splurge! It’s super nice and has a beautiful view. Refugio Torre Central – This is a very nice refugio with great heating, comfy dorm beds, lockers, and towels included. The food is great too! You have the water on your left nearly all day, and if the weather is nice you’ll see the famous mountains above you! You will go across beaches, over rivers, and up and down hills, with plenty of photo ops. Refugios on the way: Refugio Los Cuernos is about 4km from Frances – a perfect place to stop for lunch. Tonight you stay in Duomos Frances – dorms in three massive green domes on the hillside – or camping Frances. This refugio is a lot smaller than Torre Central and was really cold for us in fall – bundle up! After you trek up to the viewpoints, you come back down again and head to Paine Grande refugio. When you reach the bottom, you have about 7.5km to go along the lake to reach the next refugio, Paine Grande. Refugios on the way: You can leave your bags at a campsite at the bottom of the valley called Italiano. Most trekkers do this – they pack a day bag for the ascent and leave their heavy things at the bottom until they return down the middle straight of the W.
Paine Grande Lodge is one of the bigger refugios, with lots of space to hang out inside. It has a camping area and dorm rooms. They don’t turn the heat on until 5pm, which we learned the hard way after being turned around from the French Valley! Paine Grande Camping is outside the lodge and against the hillside, with access to amenities. Today you make your way 11km up the last stretch of the W, to Refugio Grey. This leg of the trek is beautiful, and after a few kilometers, you will get a view of the massive and incredible Grey Glacier. But, the real treat happens once you get there. 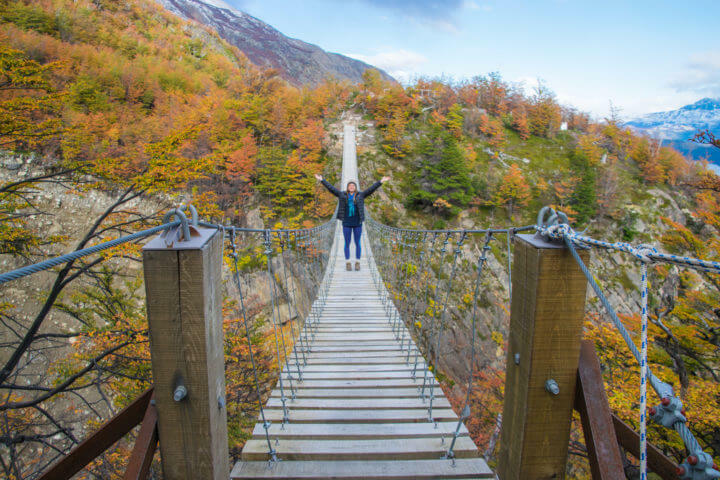 If you trek a few extra hours from Refugio Grey (and leave your heavy stuff behind), you can get much closer to the glacier and cross two incredible hanging bridges with views of the glacier. The first bridge is after about 45 more minutes, and the second is about that far from the first. DO THIS! I can’t stress it enough. This was my first clear day of the trek, and had some of the best views I’ve ever seen in my life. Refugio Grey is a bit smaller and does not have heating in each room. Like the rest, it does have a full bar and great food. We had live Chilean music too! Camping Grey is located within the trees near the refugio. They had good amenities, like a shop and a kitchen. Today you head back down the straight of the W you went up the day before, back to Paine Grande. You did it! To get out, you must take a catamaran from Paine Grande back to the other side of the park, where busses pick you up to go back to Puerto Natales. Want my expert adventurer advice? Get back to Paine Grande for an early-ish catamaran – the 11:30 one is ideal (so make sure you begin hiking before 8!). Once the catamaran gets to Pudeto, don’t take the busses straight away – wait until the later bus (for me this was at 7:20pm), and do an extra trek to another viewpoint called Mirador Los Cuernos. I was the only one of my group to do this, and it was incredible! Even after 5 days trekking, it was so worth it – what’s an extra 7km anyways?! You walk past a waterfall and past some incredible bays to get to a viewpoint that directly faces ALL of the mountains you just trekked past. You can see the Las Torres peaks and the Paine Grande peaks, and if you have a zoom lens or binoculars you can even see the little green Duomos Frances. It’s a pretty epic way to end your time in Torres del Paine and is one of the best views of the whole week. I saved my lunch to have on a beach that looked right out to the mountains, and had a wonderful few hours of solitude. Again, busses pick you up right from the catamaran and go straight to Puerto Natales (after stopping at the park entrance first as well). While booking your trek you should get this bus booked as well, or any trekking company would figure it out for you as well. You’re back in Puerto Natales – GET SOME SLEEP! Rest those tired legs, you deserve it. You can book another night in the same place you booked for your other night in Puerto Natales. 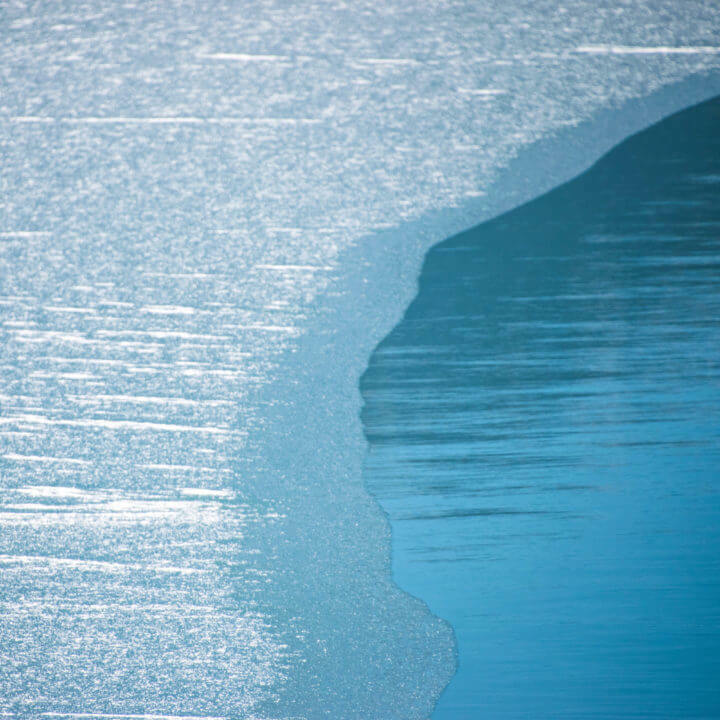 View the rest of my awesome El Calafate photos right here and buy prints if you like! Now it’s time to head to Argentinian Patagonia for the hiking and adventures offered there. First stop is less full-on and should give your legs a break before more trekking! There are a few busses daily to El Calafate from Puerto Natales – it was 2/day in fall. This bus will cross the border into Argentina (make sure you have the proper visas!) after the first hour or so, and take about 5 hours total to reach El Calafate. You’ll be traveling the famous Argentinian Ruta 40, which crosses some arid and beautiful land. Make sure to spend some time taking in the scenery between naps! The El Calafate bus station is up the hill from town, about a 10-15 minute walk from the center. You can get a taxi or opt to walk. The taxis use a meter and the driver approximated 150 pesos to us (about $7USD) , which was very high for a 15-minute walk. So… we walked! Mirador Del Lago: This lovely hotel is just outside town and, like its name suggests, has a view of the lake. It has all the luxurious amenities you could need. Xelena Hotel + Suites: beautiful 5 star accommodation with a great view of the bay the El Calafate sits on. Hotel Kosten Aike: A large and beautiful hotel property somehow nestled right in the center of town. Has a mountain lodge feel and nice spaces to relax. America Del Sur Hostel: America Del Sur hostel is located up on the hillside with a lovely view of the town, which is also about a 10-15 minute walk away. They have a lovely homey space with a fire and often have live music and Argentinian BBQ’s. Also very clean and all 4-bed dorms. Folk Hostel El Calafate: This is a new hostel (2018) right by the bus station with great amenities. It’s more affordable than other hostels in the area as well. Calafate Hostel – This hostel is right in the center of town and is very well known and popular. The location couldn’t be better and they have a nice space as well. After your bus arrives, you may have some time after finding your accommodation to check out the amazing little town. People say there’s not much to do in El Calafate, but personally I really loved the little town. There’s lots of shopping to do, lots of bakeries (Argentinian chocolate and alfajores – helloooo! ), restaurants for any budget, and many cafes with wifi! Use this day to treat yourself to a nice dinner or grab a beer in town, getting to know it a little. El Calafate is best known for its proximity to the southern part of Los Glaciares National Park, or even better yet, the Perito Moreno Glacier. I know I said the Grey Glacier in Torres del Paine was incredible, which it is, but this glacier is on another level entirely. It’s simply mind-blowing, and I can’t find the adequate words to describe it. It’s massive and stretches on for so many miles you can’t perceive the distance anymore. It’s 50-70m tall, which you can only fully comprehend when you realize that the tiny dot next to it is a two-story boat. You can choose from a few different tours to the Perito Moreno glacier. Option 1: One is a basic tour, which will take you to the viewing area and give you a few hours to explore the marked boardwalks. Don’t worry – you could walk all these boardwalks 10x over and it would still not compare to the walking you’ve just done. I wouldn’t do that to you! Option 2: Option 2 is the same as option 1, but with an hour-long boat tour up close to the glacier. You can opt to take this boat tour for an extra $25, and you go as close as safely possible to the 50-70m tall glacier. 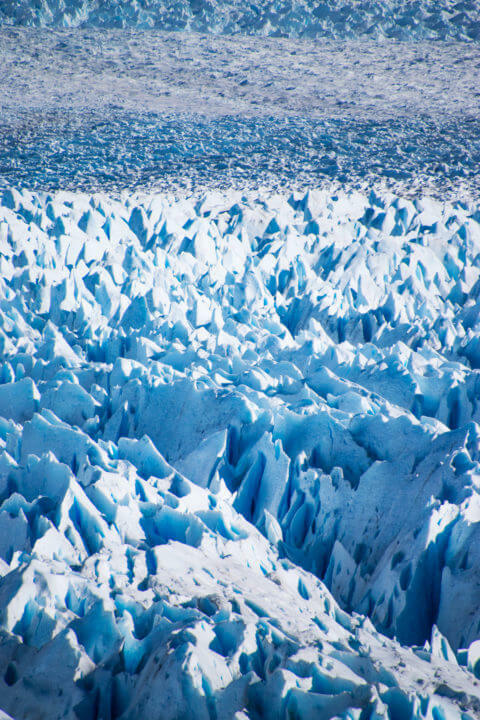 You can’t go too close, though, because as one of the most active glaciers in the area, pieces fall off every 20 minutes! This is my pick. Option 3: You can actually trek on the glacier if you are so inclined. 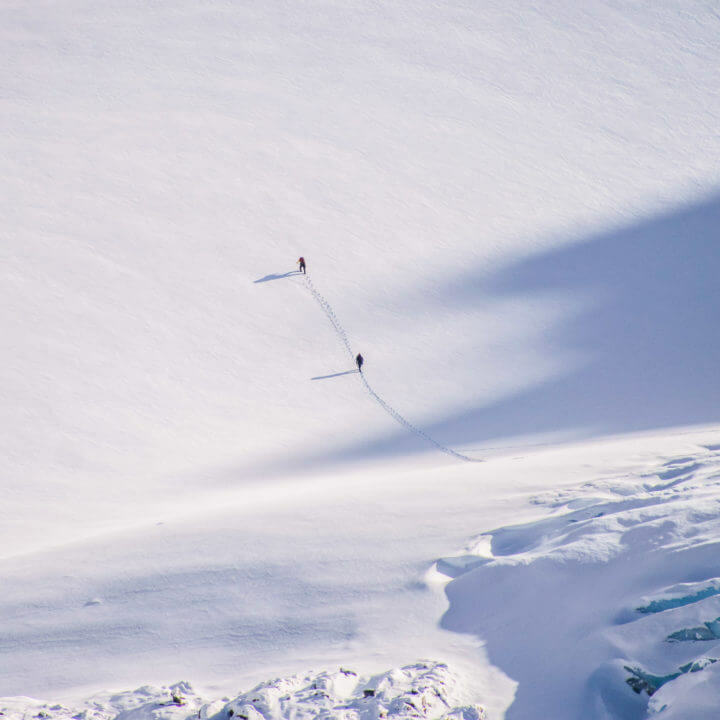 There are tours that take you to a special part of the jagged glacier where you can put crampons on and actually walk on it, and check out some glacier caves too. Luckily for you, I actually wrote an entire post about El Calafate Day Trips because it’s such an adventure hub in Southerm Patagonia! You can go ziplining, 4x4ing, hiking, biking, boating to two different other glaciers, explore a beautiful estate in the national park called Estancia Christina, or do a few other boat tours on the arms (brazos) of the national park lakes. Click the image below to see what else is available in this city! 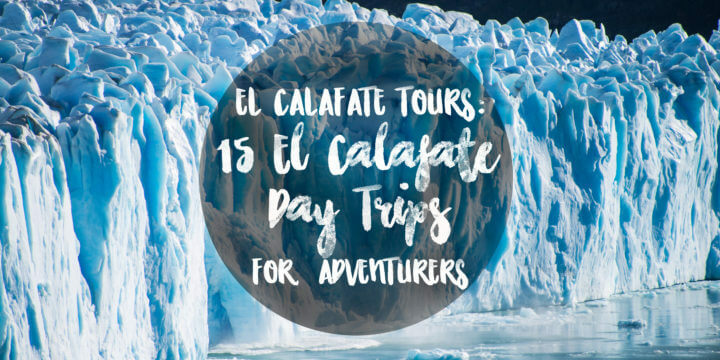 Click to view all the day tours from El Calafate to add to your Patagonia itinerary! Check out all my photos of El Chalten right here! Now that you’ve had a few days of rest (aka not trekking 20k+ km), it’s time to get back into it! El Chalten has quite a few adventures and treks, and you’ll be spoilt for choice here just like in El Calafate. Most of the hikes here can be done as day hikes and are free, which sets it apart from El Calafate and especially Torres del Paine. Here are my picks! There are multiple busses a day from El Calafate to El Chalten, which take about three hours. Busses will stop at the main bus station in El Calafate, which is slightly out of town, but will also often stop at the end of town outside Rancho Grande Hostel. Ask your driver! 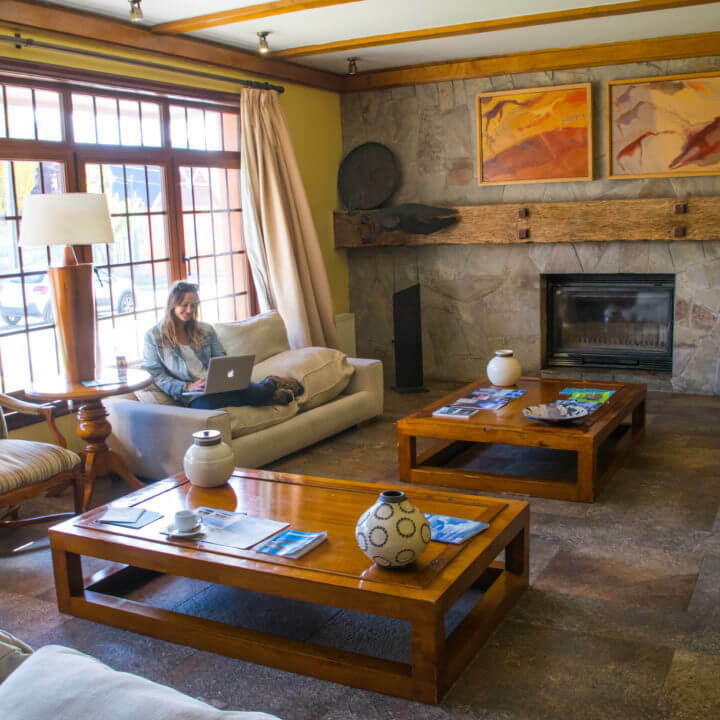 Los Cerros Boutique Hotel + Spa: Situated on the hilltop overlooking the town, Los Cerros is a fantastic luxurious choice in El Chalten. As its name suggests, it also has a spa (you might be in need of a massage or ten after all your hiking! ), lovely spaces, and fantastic views. Estancia La Quinta: Located quite far outside of the town, this is the option for people who prefer to feel removed from it all and have the feeling of truly being out in the middle of the Patagonian landscape – but still with luxury amenities. Infinito Sur: Located right in the center of town, Infinito Sur provides the amenities and comforts of a hotel but at a more affordable price. Rancho Grande Hostel: Rancho Grande is kind of the hostel to stay in El Chalten. It’s at the end of the main road, many busses will stop outside, and it has a bar/restaurant open 24h. Aylen Aike Hostel: A smaller family-run hostel with a helpful staff and community vibe. Also on the central street. Check out the rest of my photos of El Chalten right here! 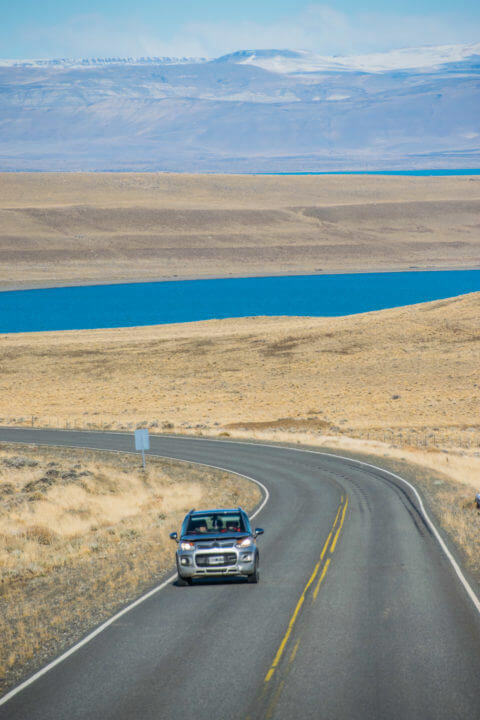 Today you can opt to take one last morning tour in El Calafate before getting a bus to El Chalten, or grab an early bus to have a half a day in the adorable little town. Again, the ride is about three hours. El Chalten is a bit smaller than El Calafate, and just as cute! There’s one main road bordered by most hotels, hostels, restaurants, shops, and cafes. You can explore the town or chill out and watch a movie – you have a big day ahead! The FitzRoy Trek to Laguna de Los Tres was one of the highlights of my Patagonia Itinerary for sure. We received a top tip from a hostel worker the night before, to wake up before sunrise and hike the first 4km to watch the sun come up over Lago Capri. We were going to trek from a different place (El Pilar) to make the hike a one-way deal rather than a round trip, but instead we took his advice that the hike is different on the way up than on the way down, and that there are different arms of the trail we can take too. Fast forward to sunrise (8:45 am in fall): this was the BEST advice ever. I got to the lake to find a completely perfect reflection of Mt Fitz Roy on an equally perfect windless day. I was already mind blown when the snowy mountaintops slowly started to turn PINK when the sun started coming up, getting more and more intense and turning a golden yellow and the sun rose. It was …. ridiculous. It was insane. It was everything. It was nature in its purest form. It was… I don’t even know. Don’t forget to check out the rest of my photos of El Chalten right here! After staying for the sunrise, you have 6-7 more km to go to reach Laguna de Los Tres. All of these kilometers are fairly flat and manageable until the last one… where it is completely the opposite. The last km is icy, vertical, slippery, dangerous, and intense. But, IT WILL BE WORTH IT! Hiking poles are a great idea for this, and watch your footing and watch out for ice. This is where I did one of the most ridiculous thins I’ve ever done, pictured in the photo above. Yes, it was freezing, and yes, it’s silly. But the photo turned out pretty rad now didn’t it?! Oh, the things we do for the gram. On the way back down, make sure to take the pathway that goes toward the ‘mirador’ which is different than the path that crosses the Lago Capri, just for some variety in your life. Now, on the last day of this 2 week Patagonia Itinerary, you have another free choice on whether you’d like to continue the adventure or rest. There’s another amazing hike in El Chalten called Laguna Torre that you can reach from town, which is much easier (less vertical) and has amazing views of Fitz Roy. 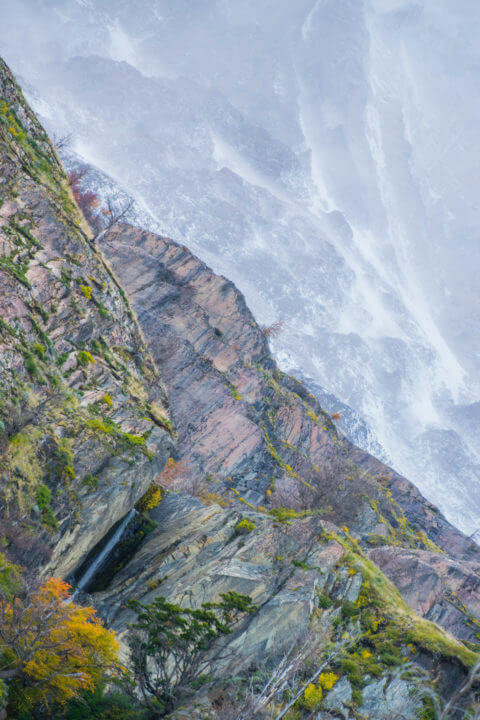 Depending on the time of year, you can also do lots of adventure activities in El Chalten, like rafting, ice trekking, climbing lessons, and kayak and canoe trips. Choose which one sounds best for you! 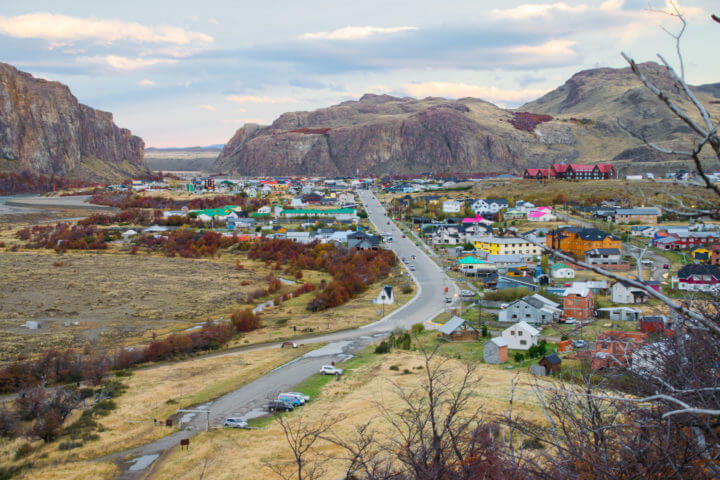 El Chalten Town… isn’t it cute? 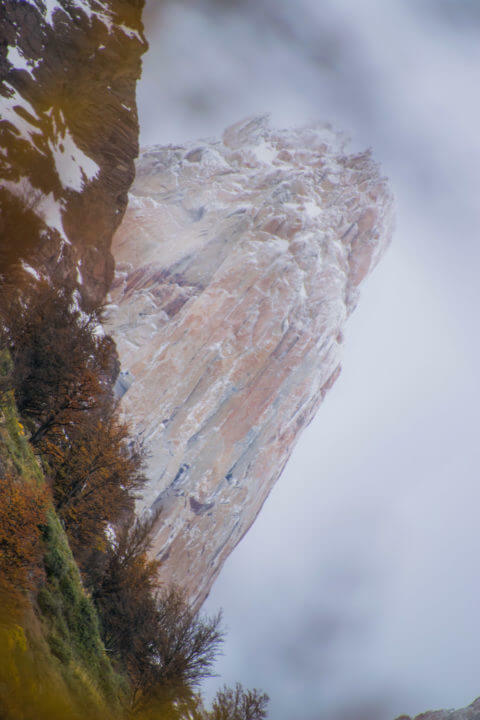 Check out the rest of my photos of El Chalten right here! Back to Punta Arenas: You can catch 3 busses back to Punta Arenas to fly out of there, in the opposite order as you did before. Punta Arenas is the cheapest to fly out of and would be easy to buy round trip tickets from if this is the end of your travels. Fly out of El Calafate: El Calafate also has an airport, but it’s much more expensive. Depending on your further travels, you can look at flights from El Calafate to skip out on a few more hours on a bus getting back to Punta Arenas. If you are traveling on, you can continue north from El Chalten. There are a few options here. Bus to Bariloche/El Bolson: Most backpackers take a LONG bus from here to Bariloche or El Bolson, especially later in the season. This skips out on a lot of the middle of Patagonia. There is not much between El Chalten and El Bolson in Argentinian Patagonia, besides the beautiful Route 40. THIS CONTINUES ON TO MY NORTHERN PATAGONIA ITINERARY – Read Here if you fancy making your two weeks into a month and seeing some more incredible parts of Patagonia. Back to Chilean Patagonia: However, if you went back into Chile, many people travel/drive/hitchhike the Carretera Austral up Chilean Patagonia, the Route 7. This is a beautiful and scenic road which, unlike the Route 40, has many possible stops along the way. You could go back into Chile at Chile Chico (bus from El Chalten) if it’s in high season, and travel up to Puerto Montt and Isla Chiloe from there. From there you could go to Bariloche and El Bolson. If you cross into Chile Chico, you could visit the Marble Caves in Chile which seem awesome, and continue of the Carretera Austral through some more awesome National Parks. OR, you could simply get the 24-hour bus from El Chalten to El Bolson, and go from there. Check my Northern Patagonia Highlights Itinerary for info on where to go from El Bolson! Don’t forget to check out my photography website for more Patagonia photography and textures! WOW, what a mind-blowing destination!!!! Completely loving every landscape.. A perfect spot to photograph a lot. Nice to know all about Patagonia! It’s truly a photographer’s paradise! Thanks so much! Oh my, aren’t you cold in that bikini shot?? Lol. Looks like a ton of fun though, what a beautiful (and cold) spot! I’d love to make it out here one day! Oh my gosh wow! All of these places look stunning! Patagonia has officially been added to my bucket list! awwh yay! I love hearing things like that 🙂 happy planning and let me know if I can help with anything else! Epic blog! So useful. 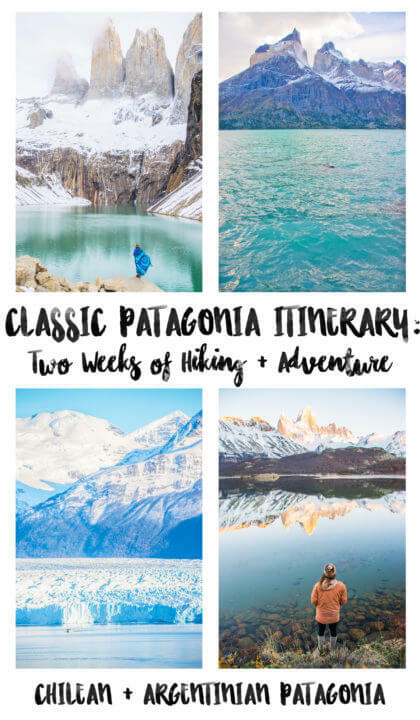 We are currently researching Patagonia so this is helpful! ahh that is so perfect! I really hope it was helpful for your planning! This is so comprehensive and the pictures are just gorgeous. I can’t wait to go!! thanks so much! I’m sure you’ll love it! HEY, I’m Kimmie. Welcome to my Blog! I’m on a mission to create my best life based on traveling, blogging, and working abroad, and I want to bring you along! I like to make the most of everything, so you’ve come to the right place if you do too. My guides and itineraries will help you squeeze every last drop out of your destinations, always with an adventurous twist and options for everyone. 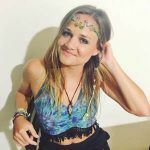 Follow me for destination and festival inspiration, good vibes, hilarious stories from the road, tips on how to make money while traveling, adrenaline-pumping adventures, and inspo to enjoy wherever you are to the fullest. Getting amongst Melbourne life/enjoying staying put in one place for a bit, catching up on content, and covering tons of Aussie music festivals! Stay Up to Date with My Recent Adventures & Sunsets! I'll send out an email to you all- just every once in a while. And I promise to keep it short, sweet, and interesting. Lots of pretty pictures and an option to read more on here! Help Me Stay on the Road… Grab Your Amazon Purchases Here At No Extra Cost! Disclosure: My blog contains affiliate links and promotional codes. When you click on these affiliate links or use promo codes to purchase something, I will get a small commission of the purchase at no extra cost to you (in fact, sometimes it gets you an extra discount!). It helps me stay on the road, maintain this blog, and continue my global lifestyle. So, thanks for purchasing through my posts! All images on this site, unless otherwise noted, are copyrighted property of myself and are not to be used or distributed without express permission from myself or proper attribution.